Most of the companies we have been studying that are going through the digital industrial transformation have been either larger incumbents or new digital upstarts. However, one party is looking at this opportunity through a very different lens. 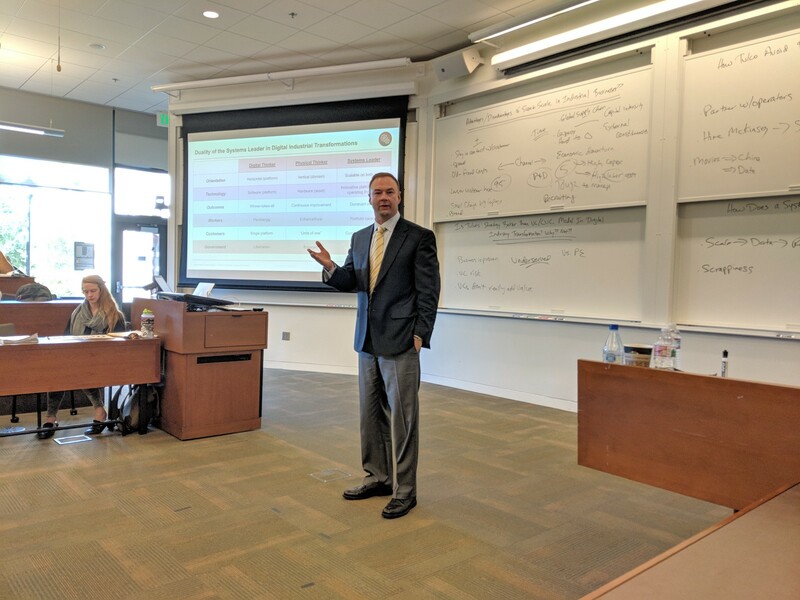 Thomas Tull joined our class and shared his activities in his newest venture, Tulco, an organization that acquires companies in the industrial space that would benefit from the addition of technologies such as machine learning and artificial intelligence to increase customer outcomes. An East Coast native, Tull is in the process of relocating his family from Los Angeles to Pennsylvania as he establishes the company’s location around the technology revival taking place in the greater Pittsburgh area. While exploiting the advantages of the growing technological base growing around Carnegie Mellon University (where he is a Trustee), Tull is looking for opportunities that blend some of the investing mindsets of Berkshire Hathaway with the operational support that can come from the best run private equity firms. With three companies already in his portfolio, Tull is looking to drive advantages in opportunities that others have missed — finding good businesses with great management teams that with capital and technology can transform themselves, while existing usually in a large, sleepy industry. Tull’s goal is to help these companies drive to outsized outcomes — both for customers and also for investors. Whether a Systems Leader is starting from a digital foundation or from that of an industrial incumbent, one of the biggest challenges that each faces is that in a rapidly changing world it is extremely difficult to tell the difference between a good idea and a good business. The former is something that is logically consistent with one’s world-view of customers’ needs, but does not take into account larger trends that can shape a market and how economic rents are distributed. The latter is something that creates unfair competitive advantage and a defendable position in a market. At its simplest level, a good business is one that meets a need for a customer in a differentiated manner — one which provides a solution to a desire or pain-point and for which a company or individual is willing to spend money. As has been posited previously, a company can best understand the relative merit of its goods and services by measuring those outcomes that are delivered to customers through said solutions. And, yet, with such an easily understandable list of appealing attributes, why do so many poor ideas get pursued by managers? Systems Leaders face an even more complicated task of trying to understand when an opportunity is only a good idea and when it has the potential of being a good business due to biases and constraints that weigh heavily on the mindsets of those approaching these new opportunities. Tull understands that technologies such as AI and ML are not magic bullets — he and his team need to carefully choose those places (“pick their spots”) where the addition of technical competencies can help grow a business. As Tull pointed out, through his experiences at Legendary Pictures and his previous entrepreneurial ventures, he’s an operator at heart — not an investor. What Tulco brings to the companies that they acquire is the ability to provide money and technological talent to a situation; Tull and his team don’t want to manage a portfolio of investments — they want to engage with existing management teams to deliver results. Tull and his team look for businesses where the addition of software in traditionally “technologically slower” companies can create changes in products, supply chains or other parts of the value chain of already large markets — but markets that might be traditionally thought of as “sleepy.” Upon finding such an opportunity, Tull and his team embed themselves in companies they acquire with the goal of supporting existing management to grow businesses. As Tull highlighted, he and his group need to find teams that are willing to make changes to improve their businesses and are open to outside support. And he needs these management teams to be hungry and driven to win in the market. 1) Go “Strength to Strength” — Systems Leaders need first to understand where their company truly has unfair competitive advantage and seek to lever this capability in customer engagements. Having absolute clarity on the strengths that a company has (vs. what strengths it hopes to have or thinks it has) is critical for understanding how to “lead with this capability” when working with customers. In a world that combines both physical and digital components for providing holistic solutions, leaders need to be intellectually honest on their true strengths and where they are engaging from a point of weakness. Tull repeatedly talked about understanding that technology could not solve every problem in a business; but rather, he and his team have to look where technology could have an impact to drive disproportionate economic outcomes. 2) Know Your Bias — Established incumbents often have a corporate agenda that drives product development decisions, go-to-market strategies and even technology choices that contribute to delivering a product or service. If a company has historically played in the high-margin, high-touch segment of a market, it will often look to find opportunities that meet its existing business models and metrics. In addition, if a company has a competitive advantage with a key technology, it may seek to push that solution into a market whether or not this solution is what is best for customers. Ergo, being aware of customer outcomes is often not enough to help Systems Leaders tell the difference between good ideas and good businesses. Awareness of how one’s perspectives and operating rhythms are shaping one’s view of the world is just as important for allowing leaders to get to the “right answer” for customers and for their companies. Knowing one’s biases — conscious or unconscious — is critical to being able to make smart business decisions. 3) Test with Trusted Partners; Enable Critical Thinking — As a company becomes larger in size, seeking rapid growth becomes increasingly difficult due to the overall size of the organization. Leadership either encourages employees to “take big swings” as the only way to have substantive impact on an organization is to find large business opportunities that can add meaningfully to a company’s size, or the company ends up making small, incremental decisions that will never drive growth at scale. The challenge with these mindsets is that new business opportunities do not start as large businesses; new opportunities need to be tested in small spaces with the belief that they have the potential of gaining scale if successful. Systems Leaders need to implement the ability for an organization to test ideas and products in a small and limited context, with the knowledge that if successful, the opportunity will have the potential to grow quickly over an extended period time as additional resources (talent and capital) are added. In some respects, this mindset is how startups use venture capital — small dollars are deployed in early rounds of funding, and larger financings are raised as a company mitigates risk. The challenge for incumbents is that when the only thing that can “move the needle” for a company requires a large size to have impact, it is frequently a challenge to work on things that are, by definition, small in size at the beginning but have the potential for breakout success. Therefore, Systems Leaders need to design organizations that have the ability to test ideas in a limited fashion, and if successful, have the potential to grow into large businesses using the resources to achieve scale. In a rapidly changing world of new technologies and market reorganizations, no individual can be expected to readily know ahead of time which new thoughts are good ideas and which are good businesses. Putting the tools and processes in place to help Systems Leaders understand when a new activity is one or the other is a critical task to ensure a successful transition to the new world order. Grove, Andrew. “Why Not Do it Ourselves?” Only the Paranoid Survive.